Mother of Iraq Veteran Who Committed Suicide: “Honor the Dead, Heal the Wounded, Stop the Wars” | Democracy Now! 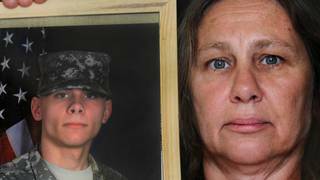 her son, Derrick, committed suicide but the military reported him as killed in action. AMY GOODMAN: “World Wide Rebel Songs” by Tom Morello, singing at a concert in Chicago celebrating Woody Guthrie’s upcoming 100th birthday. This is Democracy Now!, democracynow.org, The War and Peace Report. I’m Amy Goodman, as we return to the makeshift stage outside the NATO summit in Chicago, where scores of veterans gathered to protest NATO’s wars. ALEJANDRO VILLATORO: We’re going to begin our ceremony with a folding of the flag. This American flag flew over NATO military operations in Bosnia, Kosovo, Serbia, Afghanistan and Libya. This flag represents 60 percent of NATO’s funding and is responsible for immense militarization and intimidation, beginning with escalation of the Cold War. This flag represents the untold suffering and pain caused by NATO wars and occupations carried out by U.S. and NATO forces against the oppressed people of the world. This flag flew over Afghanistan, standing as a constant reminder to the Afghan people that they were being occupied by foreign imperial powers. This flag flew over Libya, and it came by the way of drones, bombs, bullets and grenades. This flag is draped over the coffins of thousands of Americans killed in combat and thousands more who have committed suicide after they returned from service. Currently, 18 veterans commit suicide each day. We retire this flag and give it to those who often suffer silently in war, at home and abroad. Military families and Mary, who lost her military son to suicide, represents those who lose something that can never be given back. Mary mourns the loss of her son and to thousands of parents in this country. AMY GOODMAN: After the ceremony where she was presented with the American flag, I spoke with Mary Kirkland, mother of Derrick Kirkland. Derrick joined the Army in 2007, since he was not earning enough money to support his wife and child. During his second deployment to Iraq, he attempted suicide for the first time. Mary Kirkland describes what happened next. MARY KIRKLAND: He was on his second deployment in Iraq, probably like in the six-month mark. I don’t know exactly what caused it, but he ended up putting a shotgun in his mouth over there in Iraq, and one of his buddies stopped him. They got him help while he was there, then transferred him to the hospital in Germany, where he stayed about a week and a half. Then they sent him back to his home base of Fort Lewis, which is now Joint Base Lewis-McChord. He came back on a Monday after two failed suicide attempts in a three-week period, kept him overnight in the hospital for one night. MARY KIRKLAND: There at Madigan Army Hospital at Fort Lewis. He met with a psychiatrist the next day who deemed him to be low to moderate risk for suicide, his only restriction being that he was not to be around any weapons, and cleared him for him to go basically in the barracks room by himself, which I found, after talking to the veterans, was illegal. He tried to kill hisself again on Thursday night. He got back on the 15th and killed himself on the 19th. On the Thursday, on the 18th, he had bought some rum, so was drinking rum with his medications that they did just gave him, his antidepressants and sleep medicine, and cut hisself, had bloodstains all over his room. It wasn’t successful, so he got up Friday morning and bandaged hisself. One of his things that he wrote before he went and hung hisself was “I feel invisible. I feel like I’m transparent.” And nobody walked into the room on Friday to see the bloodstains. Derrick didn’t hang hisself until—the last time they had seen him was Friday night at 10:00, and they found him Saturday morning at 1:30. If anybody would have walked in that room on that Friday—but they didn’t even—the leadership wasn’t even checking on him. So this mother got woke up Sunday morning at 6:30 to tell me that my son was dead, that I had let my guard down, 'cause he got back on Monday, he's back in the United States, he’s safe, he’s—and the Army called it a “miscommunication,” is why my son is dead. AMY GOODMAN: When did he enlist? MARY KIRKLAND: He enlisted January of 2007. AMY GOODMAN: And why did he enlist? MARY KIRKLAND: He had a wife and child, and cook at an IHOP, not enough money, went to an Army recruiter that, you know, promised all the benefits, and you get this, and he just wanted to support his family. AMY GOODMAN: What where those two tours like in Iraq that he served? MARY KIRKLAND: The first one lasted 15 months. That’s when they had changed it, and they had to stay over there 15 months. Before he went, always laughing, always, you know, a jokester. Then, when he got back in June, he—you could—the sparkle wasn’t in his eye no more. “Yes, I’m the tough guy, I’m the soldier.” That was right after he first joined that they took. But no, his eyes would sparkle, and he liked skateboarding, he liked playing guitar. AMY GOODMAN: Did you want him to go into the military? MARY KIRKLAND: At that point in time, I agreed with it, and actually it was because of Derrick that my other two younger—or, my daughter and my younger son had joined. Their father was in the Army. Their grandfather was in the Army and Navy. My father was in the Navy, with two brothers being in the Navy. You know, so he was kind of a—it’s a good thing, it’s an honorable thing, to go into the military. AMY GOODMAN: What happened when he went for the second tour of duty? MARY KIRKLAND: Well, in between getting home, he came home on leave and—I didn’t know what I know now about post-traumatic stress syndrome and the symptoms and, you know—but looking back, and, you know, like conversations like, “Mom, I’m the murderer.” And I’d tell him, “No, Derrick, you’re in a war. You know, there’s a difference between being in a war and killing somebody and just going up on the street and killing somebody. That’s a murderer.” And he had trouble sleeping, was drinking. AMY GOODMAN: Was he drinking a lot before he enlisted? MARY KIRKLAND: He drank, but not—you know, not overly drinking. Party-type drinking, you know, hanging out with his friends. And, of course, you have to realize I only got to spend probably about three days with him, while he was home on—in between the time of the leave. And like I said, I missed it. You know, I should have asked more questions or—I don’t know. You know, that’s the question I’m asking the veterans, you know, that I encounter. It’s like, what—what can I do to help? What can I do to help you? AMY GOODMAN: When did you start asking the questions after Derrick died? What brought you here to this NATO summit? MARY KIRKLAND: On March 27, 2010, is when we buried Derrick. And Derrick is buried at Marion National Cemetery, which is 50 miles—about 50 miles from Indianapolis. And as we was leaving, I stopped at a gas station, and I got a newspaper to see if they had anything wrote. And they had a picture with the Patriot Guards, and then the—underneath, it said that the Department of Defense states that Derrick was killed in action and that the family declines to comment. And that started two lies off right there. No, Derrick was not killed in action. He was killed because of failed mental healthcare at a Army base at Fort Lewis, you know. And I would have commented. From day one, I would have commented. And, to me, I am not ashamed that I have to tell people that my son committed suicide. I am ashamed of the military for failing to give him proper mental health treatment. They don’t—they haven’t even treated our Vietnam veterans, you know, and now we’re in the next generation. I am here today because I don’t want my grandchildren, you know, after I’m dead and gone, to be having to march through the streets of Chicago. AMY GOODMAN: Do you have a message for President Obama and for the NATO generals here at the summit? AMY GOODMAN: Mary Kirkland, the mother of Derrick Kirkland. He committed suicide at Fort Lewis-McChord in Washington on March 19th, 2010, after two tours of duty in Iraq.